Prime Minister Narendra Modi, who is on a two-day visit to the US capital, held a roundtable in Washington with 21 top executives of American companies. Washington: The landmark Goods and Services Tax (GST) that will come into effect in India from July 1 could be a subject of study in US business schools, Prime Minister Narendra Modi said on Sunday. "The implementation of the landmark initiative of GST could be a subject of studies in US business schools," PM Modi said while addressing American CEOs at a meeting in Washington, according to a tweet by Indian External Affairs Ministry spokesman Gopal Baglay. "The whole world is looking at India. Seven thousand reforms alone have been done by the government for ease of business," PM Modi said, as per another tweet by Baglay. Foreign investors too have been eagerly looking forward to the rollout of the single pan-India GST, which will replace the existing myriad central and state levies on both goods and services. "Growth of India presents win-win partnership for India and US both. American companies have a great opportunity to contribute," a separate tweet quoted PM Modi as telling the CEOs. 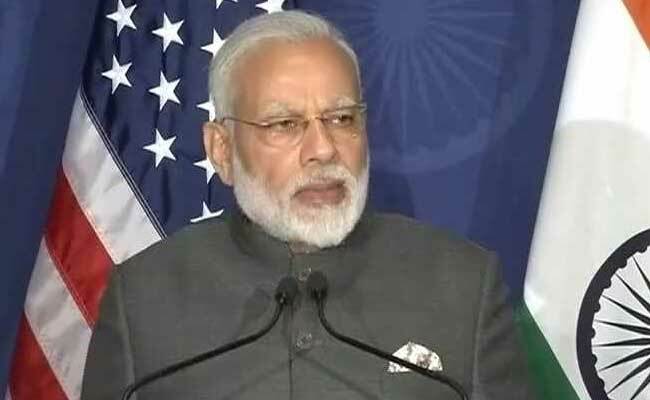 Prime Minister Narendra Modi, who is on a two-day visit to the US capital, held a roundtable in Washington with 21 top executives of American companies. Among those who attended were Google CEO Sundar Pichai, Amazon founder Jeff Bezos, Apple CEO Tim Cook and Mastercard President Ajay Banga.